Hair ties are always useful to be around. I always have one with me, either on my head forming a nice pony tail or on my wrist getting ready to be used. To add an aesthetic value to this practical accessory why not add some embellishments to it so it can look good both as a hair tie and as a bracelet when you are wearing it around your wrist? Start by gathering all the materials and determining what colour of beads you would like to use. Place bead to the T head pin. Trim head pin to length and bend the pin 90 degrees above the bead. 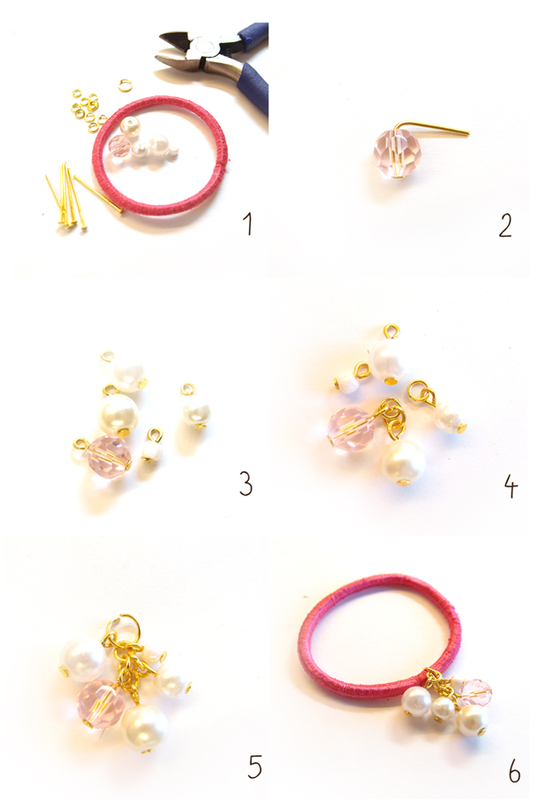 Create head pin loops to each of the beads using the pilers. Using jump rings, link the beads together. To create levels join the jump rings for two or three times before adding the beads to the end of the chain. Link all the separate sections with one big jump pin. Secure the dangle cluster to an elastic hair tie.